Who can resist those delicious cookies? Get your cookies here and we guarantee you won’t put on one pound! 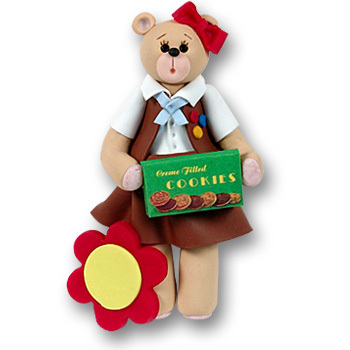 Our Belly Bear Brownette has finally arrived after many requests. She is the perfect personalized ornament or gift for any little Brownette you know. She may be personalized with a name and year on the flower. Handmade from polymer clay, she comes complete with a hook and satin ribbon for hanging. Get your cookies while supplies last!